From the jungle-clad volcanic mountains of the highlands; to the flooded delta regions; to the sandy white beaches and pristine coral atolls of the coastal and island provinces; the landscape of Papua New Guinea is as diverse as the people which inhabit it. With vast tracts of wild and undeveloped country, in Papua New Guinea, you’ll find it’s easy to imagine that you're the only person on earth! Lying just south of the equator, 160km north of Australia, Papua New Guinea is part of a great arc of mountains stretching from Asia, through Indonesia and into the South Pacific. This magical land enjoys more than 600 islands and more than 800 indigenous languages (tok ples). Papua New Guinea consists of 4 regions made up of 19 provinces and the National Capital District, each with their own distinctive character and cultures. This stunning tropical wonderland is home to the largest area of intact rainforest outside of the Amazon. The mainland is divided by the Owen Stanley Range, a massive central spike with peaks towering over 4000m. The rugged mountain terrain and deep cave systems offer wonderful adventure opportunities for walkers, cavers and climbers. Great rivers begin their journey to the sea from these mountains, among them the mighty Sepik River, one of the world's longest waterways. This spectacular river and Papua New Guinea’s delta system is ideal for canoeing, kayaking and fishing. Papua New Guinea also enjoys some of the world's best diving around its warm coastal waters, with striking coral reefs around the mainland coast and the islands of the Bismarck Sea and the Milne Bay area. The people are mostly descendants of the Papuans – Melanesians closely related to the islanders of Fiji, New Caledonia and Vanuatu. There are just over 5 million people living in Papua New Guinea – more than a third of them in the rugged Highlands. The traditional Melanesian cultures are kept alive in elaborate rituals that accompany deaths, feasts, marriages, compensation ceremonies and initiation rites. Variations in village construction, dialect and dress are common in country areas while annual Sing Sing shows, part of Papua New Guinea Cultural Events Calendar, see villagers from around the country demonstrate their singing, dancing and elaborate bilas (traditional costumes). The shows at Goroka and Mount Hagen are among the country's most impressive, attracting thousands of spectators to Papua New Guinea each year. More than 800 local languages (in addition to many minor dialects) exist in Papua New Guinea – about a third of the world's indigenous tongues. Pidgin (Tok Pisin) is common to most Papua New Guineans, and learning a few words can be handy, especially when travelling in more remote areas. Many people still live in small villages making a living from subsistence agriculture or specializing as gardeners, fishers, hunters or craftspeople; women are responsible for daily household and village work, while men take care of hunting, trade and warfare. Taking a Papua New Guinea Tour to stay in a village is a wonderful way to learn more about the local culture and lifestyle, during your Papua New Guinea holiday. However, remember to be respectful of local customs and religious beliefs, and do not wander off alone – always take a local guide with you. Most land is owned by a community or village, which means visitors will need to ask for permission to enter. 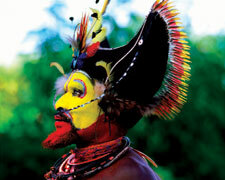 Papua New Guinea is full of interesting attractions, magnificent natural scenery, and diverse cultural heritage. Spend your Papua New Guinea holiday trekking remote jungle tracks, cruising the mighty Sepik river, surfing the waves of New Ireland, fishing around the fiords of Tufi or diving amongst the coral reef coastline. Human remains have been found in Papua New Guinea that date back to about 50,000 years ago. These ancient inhabitants of Papua New Guinea probably had their origins in Southeast Asia, themselves originating in Africa 50,000 to 70,000 years ago. New Guinea (as it used to be known), one of the first landmasses after Africa and Eurasia to be populated by modern humans, had its first migration at about the same time as Australia. Agriculture was independently developed in the New Guinea highlands around 7,000 BC, making it one of the few areas of original plant domestication in the world. A major migration of Austronesia speaking peoples came to coastal regions roughly 2,500 years ago, along with the introduction of pottery, pigs, and certain fishing techniques. Some 300 years ago, the sweet potato entered New Guinea with its far higher crop yields transforming traditional agriculture. It largely supplanted the previous staple, taro, and gave rise to a significant increase in population in the highlands. In the past headhunting and cannibalism occurred in many parts of what is now named Papua New Guinea. By the early 1950s, through administration and mission pressures, open cannibalism had almost entirely ceased. Europeans to sight Papua New Guinea first were probably Portuguese and Spanish navigators sailing in the South Pacific in the early 16th century. The principal island of Papua New Guinea was discovered around 1526-27 by Don Jorge de Meneses. Although European navigators visited and explored the Papua New Guinea islands for the next 170 years, little was known of the Papua New Guinea inhabitants until the late 19th century.